To remove the yellowness of teeth a variety of ways. Among them: self-whitening folk remedies at home teeth whitening professional products under the supervision of a physician hardware and whitening in a dental clinic. The choice of a particular method of dealing with yellowed tooth enamel depends on the cause of the problem. Having a Hollywood smile is a dream of many, because it not only looks beautiful, but also symbolizes health and success. In fact, healthy white teeth do not exist in nature as the minerals responsible for the strength, give teeth a light yellowish tint. The causes of intense yellowness of the teeth is very diverse. Repeated use of strong tea or coffee during the day leads to yellowing of the teeth due to the introduction of pigment into the tooth enamel. Smoking is fairly important etiological factor in the development of yellow coloration of the enamel, as the teeth become yellow from nicotine tars. Regular poor teeth brushing leads to the accumulation of plaque on enamel. Yellow teeth — a consequence of blood diseases and endocrine disorders. From the cause of the color change of the tooth enamel depend on how to troubleshoot this problem. If the teeth are yellowed from exposure to pigments, they can be bleached at the dental clinic to several tones by applying a special composition of the enamel and exposure to ultraviolet light, acids or laser. At home, you can use professional tools: gel, sticks, adhesive strips. They are used according to the instructions. Also at the pharmacy you can purchase whitening toothpaste that is abrasive substances contain chemicals. 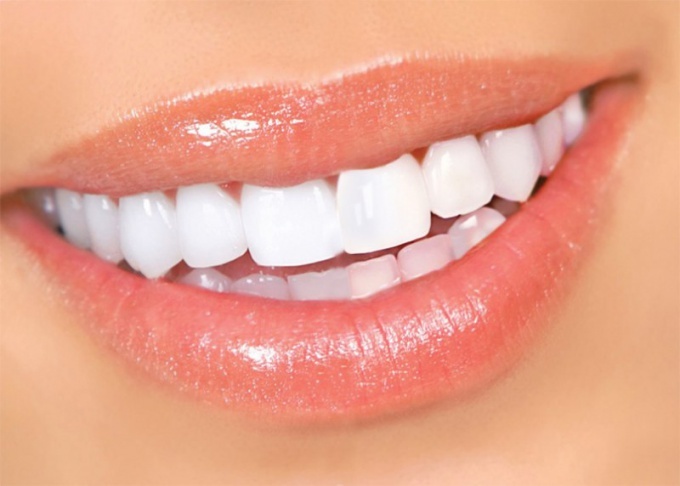 Rinsing the mouth with 3% hydrogen peroxide solution gives a good result, teeth become noticeably brighter. But this method is contraindicated for people suffering from tooth decay or other gum diseases. Among the popular methods of bleaching teeth is quite common is teeth cleaning a puree of fresh strawberries or rinsing the mouth with her juice. The therapeutic effect due to the action of fruit acids, in large quantities contained in strawberries. At home to deal with yellow teeth, you can use ordinary baking soda. To do this, simply dip a toothbrush into the solution or powder of baking soda and brush your teeth. After this procedure, they become whiter, but can be injured and hurt gums. In addition, the soda can damage the top layer of tooth enamel, so use it as a bleaching agent, it is possible not more often than once per month. Wood ash good for my teeth. It contains a lot of potassium hydroxide – compound with bleaching properties. Microscopic crystals of this substance eliminate plaque in hard to reach areas, making the teeth clean and white. Wood ash mixed with toothpaste or use in its pure form, directly causing the toothbrush.